A new species of Pseudotrapelus from Sudan, Africa is described. It differs morphologically from all other Pseudotrapelus species in its unique coloration — chocolate-red with white ocelli, also in its 3rd toe being longer than the 4th (but 16 lamellae under the 4th toe), and in one row of 6 unseparated precloacal pores in males. This new species also has 14.3% genetic divergence from P. sinaitus, and 14.7% from P. aqabensis, P. dhofarensis, and P. jensvindumi (by mtDNA COI gene). Taxonomic relationships of African Pseudotrapelus need further investigations. Keywords: Squamata; Acrodonta; Agamidae; Pseudotrapelus sp. nov.; Africa; Sudan. Daniel Melnikov, Jan Smielowski, Ekaterina Melnikova, Roman Nazarov and Natalia B. Ananjeva. 2015. 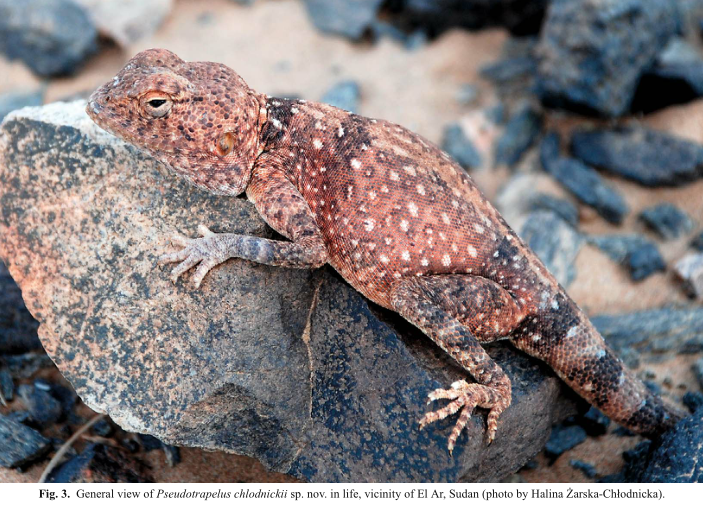 Red'n'blues: A New Species of Pseudotrapelus (Agamidae, Sauria) from Sudan, Africa. Russian Journal of Herpetology. 22(1);53 – 60.